Vinopath | Exploring the world of wine one bottle at the time! Exploring the world of wine one bottle at the time! Long Island Wine in Texas? A Wine of Exceeding Expectations. An old world style from a new world winery in North Fork of Long Island. On a recent business trip to Dallas, TX, I discovered a culinary gem in Cafe Urbano while dining with some colleagues. Mind you, the original idea was to hit the Capital Grille in downtown. I gently objected the place of choice for two particular reasons. First, I wanted to visit something ‘local‘ and secondly, and potentially a more important factor in the decision was that we didn’t have a reservation. I avoid as much as I am able to waiting more than 20 minutes in line just to be seated at a restaurant in general. Before I get into the specifics of this Shinn Estate NV Red Blend, I must share how and where I obtained this particular bottle: my colleague Carlo, an avid beer fan, had this bottle stashed in his office claiming that it was a gift from Christmas 2016. He confessed that he had not tried this wine yet and probably will never find an ocassion to drink it. After a brief conversation about IT consulting and hobbies, “Wine” came up and since I am familiar with the North Fork wineries, Carlo gave me the wine. I took it, put in my laptop bag and off we went to Capital Grill—or so we thought. After I heard that the wait was approximately 40 minutes, I inquired among my colleagues about the BYOB scene in the area. To my surprise, the consensus was “not a clue”. I searched for BYOB restaurant near me and Google pointed us at Cafe Urbano. The BYOB concept was an easy sell to my peers and since I already had a bottle of wine, why not? I ordered a Short Ribs Sandwich, knowing that the bottle was a Bordeaux-esque blend composed of Merlot, Cabernet Franc, Cabernet Sauvignon, Malbec & Petit Verdot. I have to say, I truly enjoyed my meal and the rest of the evening. In large part, because the combination of the Short Ribs with the Shinn Estate wine was some sort of controlled serendipity, if that ever existed. You see, our group was planning to hit highly regarded–and pricey Capital Grill. Understandably, the high price tag elevates the expectations, at least that’s what marketing folks would like us to believe it blindly. If it is expensive it must be good! However, the unpretentious fare from the local Cafe Urbano with the Bordeaux blend from Long Island definitely exceeded all my expectations. And apparently the expectations of my colleagues as well. The wine opened up with aromas of plum and dark cherry fruit with oaky vanilla influence. While I might be describing an every day wine, the fact that the smooth and yet firm tannins stood up well to the fatty ribs was beyond what I expected. The wine itself is extremely food-friendly with the right amount of fruit, acidity and tannins. In fact, you may need a bit of protein such as short ribs to wash it down. As the evening ended, the wine finished with emerging notes of plum, mushrooms and cocoa powder. Incredible tasty. Upon returning to New England, I found a younger version of the Shinn Estate wine at Bin 312 on North Main St in Providence for just under $20.00. Obviously, I tried it again and the notes are pretty consistent. Plum, oak and earth. Perhaps, the younger version was a bit more elegant and yet, this time around, the expectations were met. Cheers! This bottle from Wolf Blass offers vibrant purple edge to the color, saturated by ripe Barrosa fruit, the wine is supple and approachable. As side note, I opened the bottle at room temperature, roughly 70º F inside my home. The first sip felt hot, alcoholic and yet bursting with fruit. No wonder, this 2007 iteration had 14.5% alcohol. Simple solution: I lowered the temperature by surrounding the bottle in a cylindrical wine chiller. It’s amazing how a few degrees could make a huge difference while testing wines. Once it reached 66º F I tried it again and sensed right off the bat spicy and herbal aromas of white pepper and rosemary. The 2007 contains 25% fruit sourced from Eden Valley, providing the herbal edge. The wine is framed in medium tannins and finishes with persistent aromas and flavors of raspberries, white pepper and vanillin derived from 18-months aging in new and seasoned French and American oak respectively. I bought this bottle at Stop Wine & Liquors in Pawtucket at $22.00. I was surprised to find a 2007 on the shelf, somewhat unconspicuously between rows of wines. What a find! Coincidence or Is it’s Just South Africa Week? An Old-World wine from an up-and-coming world-class destination. Last week I was mainly working on two things: My skiing and my Actuarial lingo. I am doing a consulting gig for a reputable Insurance Company in Rhode Island where I met Dale, a colleague from South Africa. We briefly talked about education, our career paths, collaborative work, the beautiful landscapes scattered throughout his native country and specifically about Stellenbosch, or ‘Wine Country’ as he eloquently put it. Fast forward to the weekend and I found myself skiing at Sunday River. On my way up to Maine, I picked up a copy of the Economist and surprise, surprise, I found half a dozen references to South Africa and two lengthy articles about Cyril Ramaphosa, South Africa’s president. Well, if that wasn’t enough, my skiing plans included meeting up with a friend who I often help him select wines for his collection. At the end of our first ten runs, we decided to break for lunch at Brookside’s Condominiums. As a thank you gesture for my helping him build-up his wine celar, he gave me a bottle that he had stumbled upon in “New Hampshire:” The bottle was a Meerlust Red 2017, a typical blend most commonly found in Bordeaux: 60% Merlot, 19% Cabernet Sauvignon, 17% Cabernet Franc and 4% Petit Verdot. The wine opened up mildly aromatic with floral, peppery notes highlighted by freshly crushed pomegranate. However, the wine was really tight and flat. After half a glass, I was unimpressed with it and let the rest of the experiment to aeration. After all, I had made the mistake of mentally comparing the Meerlust Red 2017 to one of my favorite wines from South Africa: Glen Carlou Grand Classique another Bordeaux-esque blend from Paarl. About six hours later the wine actually developed some complex aromas and flavors. But the experiment wasn’t done yet. Unintentionally, I let it rest for another full day and those initial floral aromas gave way to nuances of toast, leather and minerals. Once the wine developed complex flavors, it really reminded me of a Medoc wine from Saint-Julien, but the wine is from South Africa! After doing a little bit of research, I found the wine at the Wine and Liquor Outlet in Portsmouth, NH for just under $20.00, a decent QPR wine. So, was it coincidence that last week was all about South Africa, my colleague, The Economist and even my weekend bounty? Well, I don’t believe in coincidence. In the words of Morpheous in the Matrix Reloaded, “I believe in Providence.” I ended up enjoying the wine for its character and charm with some help from oxygenation, leaving the final glass loaded with tobacco, plum and dark chocolate notes and some grip thanks to the tannins. For those who have tried the trendy new-world style wines from Paarl and even other Stellenbosch wines such as Stark-Conde, this Meerlust Red is a tried and true rendition of the old-world style.But don’t believe me, the real experiment is when you’d try it yourself. The unintentional experiment of leaving it exposed to oxygen for too long is a good indication that the wine will age well. In fact, I could argue that the this 2017 iteration of Meerlust Red will not be ready to drink until 2022, but why wait? In either case, as the week came to an end all I can say is Go South Africa and cheers! Hint:from Esporão and it’s not Port! Quatro Castas means literally four cépages, or four varietals. To pique your curiosity further, it’s made of equal parts of Touriga Nacional, Trincadeira, Syrah and Alicante Bouchet. For the sake of learning, let us review first the local Portuguese grapes. Touriga Nacional is mostly associated with the production of Port wines. Well, in fact most of all indigenous grapes in Portugal such as the ones listed here, are associated with Port production since Port wine could be made of up to 100 different grapes. Trincadeira, is the local name of Tinta Amarela which is widely planted in the Alentejo Region, it produces rich red wines of full body. Alicante Bouchet is the local name for Garnacha Tintorera, which is a teinturier grape of red skin and pulp used mainly for adding color and structure to red and Port wines. Quatro Castas is a full body wine with heady and spicy aromas that might require pairing with a slab of steak to complement the abundant dark plum and dark cherry flavors framed by medium weigh tannins. It finishes persistently earthy with cocoa notes. What you may like the most is the QPR at $16.00 per bottle. I bought this bottle at Seabra Super Market in Attleboro, MA. Italian wine-making in México since 1928. México was the first producer of wine in the entire American continent when the Spaniards planted vines, cultivated grapes and made wine in their new colony. In fact the first commercial “new world” winery in the Americas was founded in 1597 in the Valle de Parras, México and it has continuously operated ever since then. Let’s review a bit of history to get the obvious out of the way. Why Mexico’s wine industry never developed the way Argentina and Chile did? The simple explanation, according to historians, lies in México living and surviving its own Prohibition. Wine was an essential part of life for Spaniards conquistadores. The first wines made in the Americas was shortly after the conquest of Mexico in 1521 using wild vines. Wine was also an important part of Mass for the missionaries that came after Cortez. After all, there was a lot of work involved in converting infidels! Cortez, envisioned improving the wines of the colony planting varietals brought from Spain. By 1596 Mexico had improved its wines and had developed its own commercial wineries, threatening sales of Royal wines imported from Spain. That year King Philip II forbade new plantings and replacements effectively establishing prohibition in Mexico. This prohibition lasted 300 years, impacting demand, winemaking and wine-drinking ethos frankly. Onto L.A. Cetto winery now and its own history. The origins of the winery date back to 1926 when Italian immigrant Don Angelo Cetto inspired by his European roots, established a wine-making business in 1926. Ironically, it was the Prohibition in the US which propelled the quality and quantity of wines made in Mexico, across the border from San Diego in the Valle de Guadalupe. By 1928, L.A. Cetto winery had started with familiar grapes to Don Angel such as Nebbiolo, Barbera, Dolcetto, Aglianico and other local varietals. In 1967 additional plantings of international varietals such as Cabernet Sauvignon, Chardonnay and Petite Sirah, signaled a turning point for wine-making in the Valle de Guadalupe. 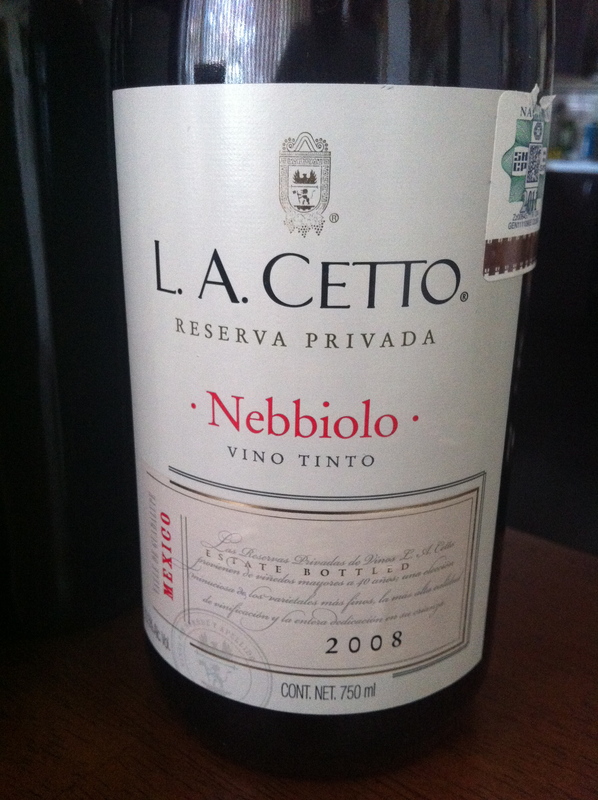 This particular bottling of L.A. Cetto Nebbiolo wine is extremely food friendly, quite approachable and full of charm. Don’t expect a taste a northern Italy here. Instead look for a chalky-smooth feel, even a bit of salt water and a delicious overlay of ripe cherry, blackberry and raspberry notes. Perfect for hard cheeses, bruschetta and light Mexican fare. Hard to find outside of Southern California and NY, but if you come close to it, give it try! At a recent dinner, I was tasked by a couple of friends to bring Spanish wines that were off the beaten path. The challenge: one of these friends is fond of red Rioja while my other friend dislikes it. Worse yet, they had been disenchanted with their previous selections hailing from the Iberian Peninsula. I thought I would throw them a curve ball. I selected two reds, an “unknown” wine from Rioja (Loriñon) and a wine from an “unknown” region (Calatayud). Obviously, in this particular ocassion, the “unknown” applied to my disenchanted friends. Loriñon Rioja, from Bodegas Brenton, is made in a classic old world style. For starters, the fruit used for this particular Loriñon wine comes from vineyards located in the Rioja Alta, at the highest elevation in the region. Typically, wines from Rioja Alta are bright and earthy, making them exceptionally food-friendly. Furthermore, this Crianza has been aged in american oak barrels adding an element of elegance and age-ability. This peculiar bottling offers aromas of freshly crushed fruit and spiced with fantastic oak undertones. Although I love oaky Riojas, this iteration is well balanced such that one could taste the layers of fruit, minerals, spices and oak working well together. For the uninitiated, the predominant grape variety in Rioja is Tempranillo. According to the Wine Bible, a typical Rioja wine may contain around 60% Tempranillo, %20 Garnacha and smaller percentages of Mazuelo and Graciano grapes. In terms of the maturing of the wine, crianza means (literally “nursing” in this context) that the wine was aged no less than 12 months in oak barrels and 12 additional months in the bottle. In case you wonder, Reservas are aged 24 months of which at least 12 months must be in oak barrels and an additional 12 months in the bottle prior its release. Grand Reservas are aged 5 years, spending no less than 18 mont in oak barrels and 36 months in the bottle. By the way, this wine paired very nicely with grilled lamb rubbed with rosemary and garlic. I decided to decant this it because at first, it was tight, despite its age. After two hours in the decanter, it got better and better sip after sip. This Claraval wine is from Calatayud, a relatively new and small DO in the Province or Zaragoza, acquiring DO status in 1980. Although there are seven authorized grapes in Calatayud (Garnacha, Mazuelo, Tempranillo, Monastrell, Cabernet Sauvignon, Merlot and Syrah) to make red wines, the most relevant grape variety in Calatayud is by far Garnacha. This 2006 version consists of 50% Garnacha, 20% Cabernet Sauvignon, 20% Tempranillo and 10% Syrah. This wine is rich, loaded with notes of chocolate, charred fruit, leather notes. It finishes with a core of cherry and blackberry fruit that it is almost impenetrable. At first, I was tempted to pair it straight up with the lamb, which it actually worked well. However, I thought that after aeration, the perfect partner food-wise was Jamón Iberico and manzanilla olives. In either case, please do not believe me. The truth is in the bootle. Try it! Are Wines from Washington age-worthy? When was the last time you had a succulent wine originating from the state of Washington? I recently tasted a couple of Washington wines during a visit to Seattle. As a matter of fact, I had an epiphany after visiting Chateau Ste. Michelle and tasting their Ethos Merlot 2005 early this year(2015). The 10-year old wine was astonishing, reminding me of the tried and true Napa Valley’s recipe for successful Cabernet: Ripe, decadent and complex. Except this was a Washington Merlot! Shortly after my trip, I went on a rampage looking for Washington wines, which brings me to the point of this post. How come I have never heard conversations about Washington wines age-ability? First, I have to admit that I had been paying way too much attention to California and Oregon wines; Napa Cabs and Oregon Pinot Noir respectively. As I researched more about the Ethos wine, I realized that some of the best Washington wines had built a reputation on “Right Bank” Bordeaux blends, anchored with Merlot. Like Bordeaux, Washington has a cooler, shorter growing season. Accordingly, winemakers decide on the composition of their fabulous blends depending on each vintage, using varying amounts of Merlot, Cabernet Sauvignon and Cabernet Franc. Now onto these wines in the pictures. 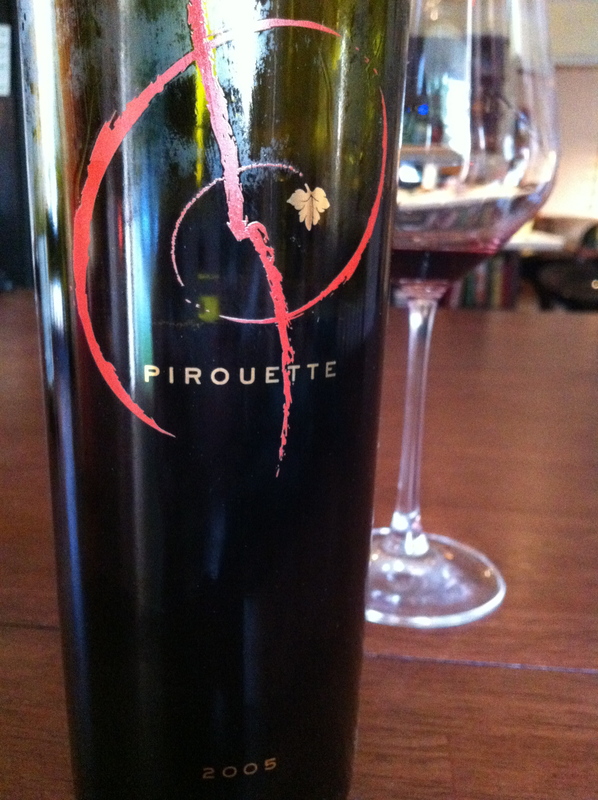 The one on the left is the 2007 Pirouette, from the Long Shadows Vintners, composed of Cabernet Sauvignon, Merlot, Cabernet Franc, Petit Verdot and Malbec. It opened up with forward aromas of vanilla, black cherries and minerals. My preliminary impression was that the wine was a bit tight, which lead me to do an experiment. After the initial taste, I let it air. Every two hours, I would taste it again, make some notes for a later comparison in order to extrapolate and make assumptions about its age-ability. Yes, my experiment involved getting up at 2:00AM, 4:00AM, 6:00AM and so forth to properly take a sample. Of the twelve samples, right around the 6th sampling, the bouquet reached its pinnacle. The round, soft, and elegant mouthfeel was lingering and satisfying. However, afterward the bouquet lost grip but the flavors remain pleasant. For the price of $50.00 at Marty’s in Newtown, MA, I thought it was a borderline good value, considering my specialty is finding values in the $20.00-30.00 range. 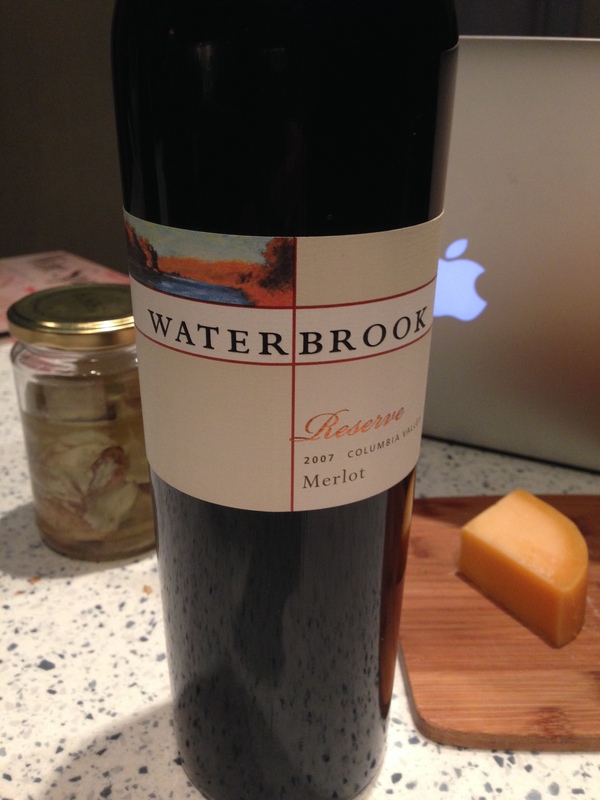 The second wine, Waterbrook Reserve 2007 Columbia Valley Merlot, was a bit easier to analyze but I must admit that knowing the price prior tasting impacts expectations. The wine was balanced with intense aromas and flavors of black cherries with hints of cedar. On the palate, the wine was full body offering the richness and texture found in more expensive wines. Finishes with earthy notes, mellowed tannins and concentrated fruit flavors. Alas, no 24-hour aeration experiment! The tannins of the wine suggested meat and I assure you, complementing it with sirloin tips was an excellent option. For this, I paid $20.00 at One Stop Liquor in Pawtucket, RI. Perfect Pairing: Textbook Malbec and Steak. Few things, among the simple meals I consider comfort food, provide pure pleasure such as a juicy slab of steak accompanied by a bold and tannic red wine. Particularly if the red wine is a fine textbook Malbec from Argentina. Malbec hails from Bordeaux, where is one of the six grapes permitted to be part of a Red Bordeaux blend. However, after the phylloxera epidemic of 1850 hit the region, Malbec almost disappear and became less popular in Bordeaux. These days Malbec has found a new home in Cahors and all the way to Mendoza, Argentina, where it is now the prominent grape in both regions. Unlike the tried and true Old World Vs New World wine comparison from Cabernet Sauvignon to Syrah to Pinot Noir, Malbec provides one of the few examples where one could draw stark distinctions between wines of the same grape, made in different places. But these disctictions are not derived from terroir alone. While Cahors sticks to tradition producing wines with a more austere flavor profile, brooding fruit, tannins and minerals, Argentina produces more opulent wines, intense, fruit-forward and spicier. A key factor in these differences is the climate. Mendoza enjoys more days of sun and drier growing seasons, resulting in riper grapes than those in Cahors. Now, the proof is in the bottle. 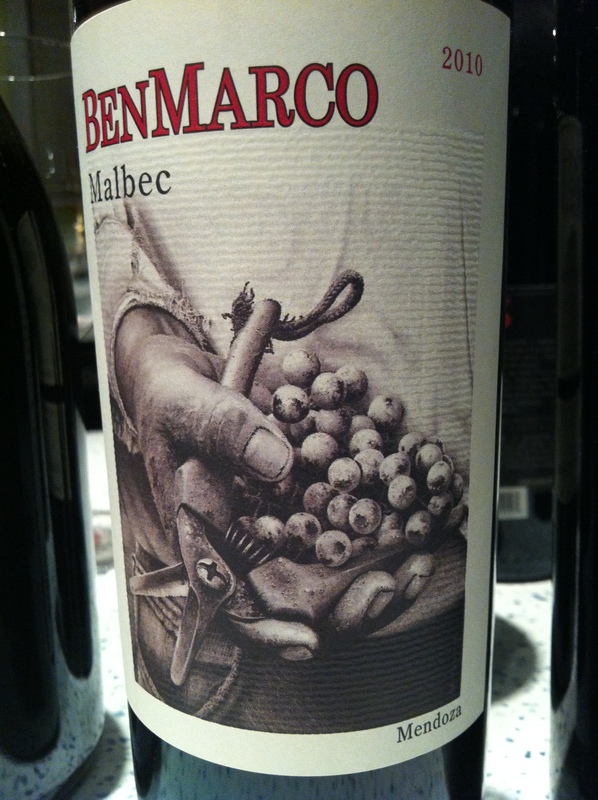 This Malbec comes from Bodegas Dominio de La Plata and this 2010 BenMarco is what I consider a textbook Malbec because it represents an unresolved tension between Old and New Word style. Opens up with lush aromas of vanilla and oak, highlithed by hints of earth, black currant and spice. Finishes long focusing on the tamed tannins. The wine is unfiltered and furnished with about 12% of Bonarda. Paired deliciously with a marbly Rib Eye and green beans sautéed with garlic. Bought at Pops Fine Wines in Easton, MA, for $22.00. Have you tasted Vino Nobile Di Motepulciano lately? You should! Although the wine has been made for centuries before it was declared the king of wines in Francesco Redi’s poem in 1685, the name Vino Nobile de Montepulciano was coined in the 20th century. Surprised? Even more surprising is the fact that this delicious wine was once labeled as Chianti in the late 19th century. Vino Nobile di Montepulciano means Noble Wine from Montepulciano, a small Tuscan town about 70 miles south of Florence. Please, do not be confused with another Italian wine named Montepulciano D’Abruzzo. As you may surmise, in the latter, the grape is Montepulciano and it is produced in the Abruzzo region. Vino Nobile on the other hand, like many of its Tuscan counterparts, is a blend consisting mainly of Prugnolo Gentile (Sangiovese) with smaller percentages of Canaiolo and Mammolo grapes. Similarly to a Spanish Crianza, what earns this wine the Nobile characterization is its aging. This wine has twenty four months of aging of which twelve are spent in oak and the remaining twelve in the bottle. Furthermore, the Riserva wines spent twenty four months of aging in oak and twelve in the bottle. 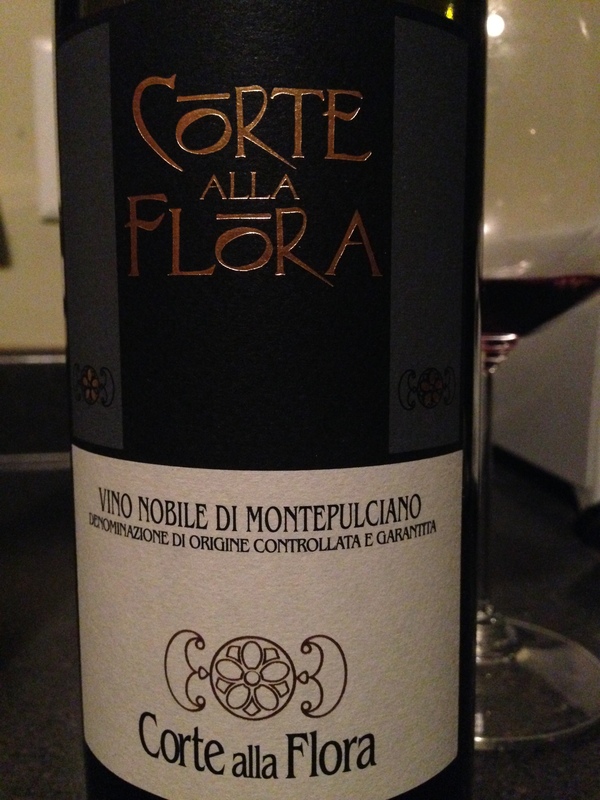 This iteration of Vino Nobile from Corte Alla Flora is mellow and balanced with flavors of black cherry, vanilla, hints of sage and loaded with minerals. The finish is persistent and elegant and if you combine this wine with Castelvetrano Olives and Manchego cheese, watch out, it could be addictive! It was fortunate having enjoyed this wine during an amazing evening with my friend AJB. Long live the holy Quaternity: Conversation, Wine, Olives and Cheese. No bread was necessary! The wine was purchased at Krogers in Smyrna, GA for $28.00. A few days ago I had the opportunity to chat with Market Research extraordinaire Andrea Burns in Atlanta, GA. We exchanged observations about a seemingly highly regarded IT corporation. Quickly, the evening was waning away and such a fantastic conversation succumbed to the delirium of trying a bowl of homemade gumbo. Obviously, these food lovers immediately debated the merits of using okra as an ingredient in Gumbo. I calmly explained that the most important part of gumbo (now I know, besides the okra!) was pairing it well with a fine wine. Finding a suitable partner for the gumbo was extra challenging because my most gracious hostess has an inclination for really dry wine. What to drink? Well, the complex flavors of dry and nutty Amontillado ‘Sherry’ could not have been better accompaniment for her tasty gumbo. BTW, if you care to know, the word Sherry is simply an anglicization of Xeres, the name of the area (D.O.) in the southwest corner of Andalucia, Spain, where this wine is made. Xeres, was founded by the ancient Phoenicians more then 3000 years ago and at some point or another Greeks, Romans and Moors ruled it. The key to this subtle, elegant and remarkable wine is the combination of Palomino grapes, white chalk and Flor. The chalky white ground in the Xeres vineyards almost bakes the vine by reflecting the strong sunlight up to the ripening Palomino grapes. At harvest time, the clusters of grapes are set down on a mat grass to dry under the sun. Once the the clusters loose water to evaporation, the Palomino grapes are squeezed and the resulting mosto is stored in huge bungs to begin fermentation. The magic happens during this period. These bungs must have a hole for aeration, as Sherry is one of few wines in which oxigenation is actually beneficial for its production. With air flowing into the bungs, a yeastlike fungus starts coating the surface of the mosto. At this point, not even the winemaker knows if the resulting wine will be Fino or Oloroso Sherry. Why? This would depend on the yeastlike Mycoderma vini fungus also known as Flor, the mysterious agent that determines the fate of the wine. The Flor is thickest on wines which will become Fino and thinest on those destined to become Oloroso. Once the Flor finishes imparting flavor to the wine beneath, dies and sinks to the bottom. After the Flor has done its work the wine is racked, graded and fortified with Brandy. Finos are lightly seasoned with Brandy, while Olorosos would take a little more of the spirit. You see, it is not that simple to eat gumbo. You need great conversation, a great cook and a magic moment. 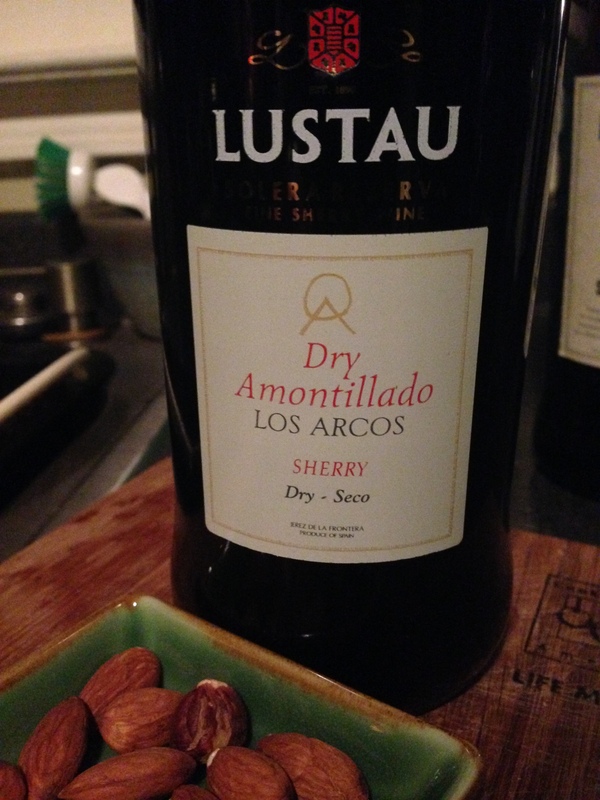 The sherry, well, you may get it at the store. I bought this bottle at Whole Foods in The Exchange At Hammond in Atlanta for $22.00.